(1) The card mount measures 4 1/8 in. by 8 1/2 in. and is 0.063 in. thick, the photograh measures 3 1/2 in. X 7 1/2 in. The edges of the card are beveled. The card stock's original color appears to have been buff or tan (matte finish) front and back. (2) The photographer’s imprint on the front (recto) of the photograph lists the photographer as The Falk Studio, 14 and 16 West 33rd St. N.Y.
(3) Handwritten in ink on the verso is Lillian Russell in "Lady Teazle." For story of her home Dec. 18. In small print at the bottom of the card is Lillian Russell panel cabinet card. The card is smaller than a true Panel card, ca. 1900. Panel cards generally measure 4 in. X 8 1/2 in. for the image and 8 X 13 for the mount. It is also similar to a Boudoir card which measures 5 in. X 8 1/4 in., ca 1890. Conclusion: The card properties are only one clue and do not offer a definitive answer. The card is consistent with cards printed 1890 to early 1900s. Benjamin J. Falk was one of the leading New York photographers who specialized in celebrities. His studio was originally at Twenty-third Street and Broadway, on the site of the present Flatiron Building. He was a well-known New York photographer in the 1880s. He left Twenty-third Street and Broadway and established a gallery in the Waldorf-Astoria at West 33rd Street. The imprint contains the address only and is located on the front of the card. 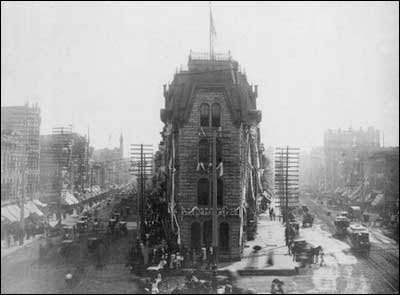 The Flatiron Building construction was completed in 1902. Falk would have had to have moved to the Waldorf-Astoria at least one year prior in 1901. I have found no information that indicates that Falk ceased operation of his business at any time. We will assume for purposes of this discussion that he occupied the West 33rd Street premises from 1901 until his death on 19 March 1925. The photographer's information indicates a time period of 1901-1925. The period of operation is consistent with the card properties analysis of the early to mid-1900s. Here we have a significant clue. Lillian Russell is depicted in what was called a character portrait, Russell as the character "Lady Teazel". In 1904, John Kendrick Bangs and Roderick C. Penfield created a comic opera version of Sheridan's play "The School For Scandal" for Lillian Russell. The role of "Lady Teazel" was played by Miss Russell. The photograph used to advertise the play at the Casino Theatre in 1904, in the New York Times, is very similar to our Photo of the week. 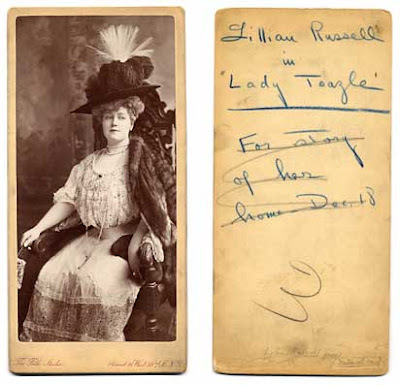 Miss Russell died in 1922 and it appears that "Lady Teazle" was her last role on the stage. The Lillian Russell in this photograph looks the approximate age of the advertisement in the New York Times. The advertisement and the role of "Lady Teazle" are dated 1904. 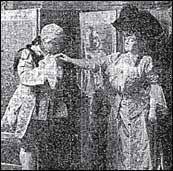 The play ran from December 1904 into 1905. Lillian Russell did not appear as "Lady Teazle" after this run. The first run of Russell as "Lady Teazle" would be the most likely time for the character portrait to have been taken and sold, as this would have been the period when it was most economically viable. The biography (role 1904, death 1922), photographer (West 33rd St. 1901, death 1925), and card stock analysis information are consistent with the date of the cabinet card being 1904/05. Lillian Russell's story is too amazing not to explore. From her four marriages, to her affair with Diamond Jim Brady, her work as a suffragette, her fact finding mission on immigration for President Harding, and her beauty, she led a very full life. 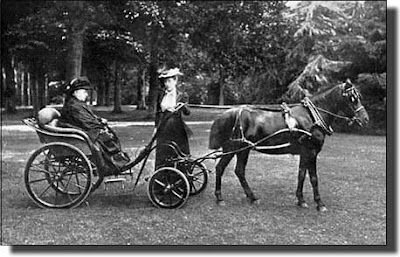 Wednesday, April 2, I will explore Lillian Russell's life here on Shades Of The Departed. 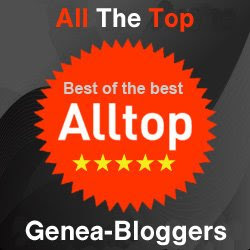 Not to be overlooked is the photographer Benjamin J. Falk, a pioneer in an area of the law that has been discussed in depth on the GeneaBlogs; copyright. Falk will be explored on Shades Of The Departed on Thursday, April 3. Darrah, William C. Cartes de Visite in 19th Century Photography. Gettysburg: Darrah, 1981. McCulloch, Lou W. Card Photographs, A Guide To Their History and Value. Exton, Pennsylvania: Schiffer 1981. Unknown, "Benjamin J. Falk Obituary," The New York Times, 22 March 1925. Online archives. http://access.newspaperarchive.com : 2008. Unknown, "Faces of The Noted" The New York Times, 25 February 1883. Online archives. http://access.newspaperarchive.com : 2008. Unknown, "Lady Teazle in Baltimore" The New York Times, 20 December 1904. Online archives. http://access.newspaperarchive.com : 2008. Lady Teazle Advertisement, New York Times Historical Database, December 25, 1904, New York, N.Y.
(http://proquest.umi.com/ : retrieved 15 March 2008). Twice Told Tuesday is a new feature on Shades Of The Departed. Each Tuesday a photography related article will be reprinted from my collection of old photography books and magazines. In honor of Women's History Month, I am reprinting an article told 92 years ago in The Amateur Photographer's Weekly, February 4, 1916. The Local Manipulation column does a tongue in cheek discussion of why women should take up photography. 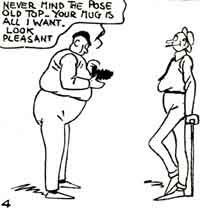 The cartoons have been added from The Amateur Photographer's Weekly of June 16, 1916. Women should take up photography more generally than they do, it is an ideal avocation for them in many respects. And it would help to fill up their time. The great trouble with women nowadays is that they don't have anything to do. Taking care of babies and cooking meals and sewing on buttons are hardly enough to keep an able-bodied woman out of mischief and when an able-bodied woman does get into mischief, look out for trouble. I know of nothing that should more properly inspire wholesome dread. But, of course, there are a great many women who don't even have cooking and babies with which to amuse themselves and ward off the dangers and dissipations of idleness. Why don't more of them buy cameras and go after the hot stuff that the men photographers have been pulling down these many years? They could reach it lots of times, when the men can't. There's a reason. For one thing, a woman has nerve, lots of it. She will order a set of dishes C.O.D., and send it back to the store after she has given a dinner party to her friends. No need to to on. 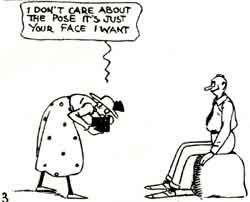 You all know how mjuch nerve a woman has, It would help her a lot in photography. She wouldn't be feazed a bit when people stared at her as she made a picture. In fact, she would like it. Women were made to look at, and they know it. Ask them, if you don't believe it. Then again, a woman can always extract a smile. Sometimes it is a sickly smile, but a smile's a smile for all that. It's worth something in a portrait. "Hold your head up, Jack, so that I can show that lovely chin." Can';t you hear it? Can't you see Jack beaming all over. "Aw, come off, Mag; quit yo' kiddin." If a male amateur were taking that picture he would say, "Sit up, you old duffer; don't slump down like a lump of dough. What do you think this is, anyhow? A picture of General Debility?" Then besides that, once a woman got started she would go anywhere to get the picture she wanted. She's used to bargain counters and shopping competition, and she wouldn't hesitate to walk right into anywhere and stay until she got the thing. Nothing would stop her. She might repent afterwards and wonder whether people thought he bold, but while the game was on she would play it to the limit. If she went out walking with a friend, she wouldn't mind keeping her (or him) waiting an hour or two while she made some views, not she. She would hand him the baggage and tell him to tote it right along. Then think of all the education a woman could get out of photography. She could learn all about the composition and pyro and developing tanks and mounting and making money out of one's friends by selling them prints, and a great many other things that betoken the well-furnished mind. Educationally, photography should prove a god-send to every woman. Think of all the perfectly good space there is in many women's minds today that isn't filled by anything. If this space could be filled with photographic ideas, the other ideas wouldn't rattle around and bump into each other so much. And there isn't anything that makes a man quite so nervous as this rattling and bumping of loose ides in a woman's mind. But the finest thing of all would be the blessing it would be to the men if women -- all of them -- took up photography. As matters stand now, the male amateurs have to endure altogether too much. They have to pursue their hobby by stealth and indirection, to avoid the women's watchful eyes. They have to use a corner of a musty cellar for developing when they woud like to use the kitchen sink, They have to go out to dances and be made the subject of sarcastic remarks on big feet when they would rather stay home and make prints. They have to go along and carry packages home from the store when they would rather be off photographing with some congenial soul, or alone. They have to do a lot of things they don't want to do, and can't fool with photography half as much as they would like to. But if the women were all amateurs how different it would be. We should have plenty of sympathy then, and the only difficulty would be in trying to make the women stay home when we went off after pictures. But the men would have to pay for it all just the same I suppose. The Intensifier. “Local Manipulation.” The Amateur Photographer's Weekly, February 4, 1916, 111. Ketton, Maurice. “Summer Snapshots.” The Amateur Photographer's Weekly, June 16, 1916, 569. My daughter found this photograph of a beautiful little girl in an antique store in Monroe, Washington. She was captivated by so tiny a little thing wearing pearls and brought her home for my collection. My daughter has a good eye, this is a wonderful photograph and I am equally captivated. (1) The card measures 4 1/4 in. by 6 1/2 in. and is 0.034 in. thick. It has notched edges with gold embossing. The card stock's original color appears to have been buff or tan (matte finish) for the front and yellow (glossy finish) for the back. (2) The photographer’s imprint on the front (recto) and back (verso) of the photograph lists the photographer as Rugg, 56 South 5th Street, Minneapolis. (3) Handwritten in ink on the verso is Mary Irene Brunton Reynolds. The card's measurements are consistent with a cabinet card. The thickness of the card stock indicates a time period of 1880 to 1900. The deckled edges indicate a time period after the mid-1800s. Edges were often covered with gilt after 1870. The use of different colors of card stock for the face and back of the mount indicates 1880 - 1890. Face of buff, matte-finished, with a back of creamy-yellow that is glossy indicates 1882 - 1888. Conclusion: The card properties indicate a time period of the mid-1800s. How I wish every state historical society maintained a database of the photographers that operated within their state. It would be such a wonderful resource for collectors and family historians. Minnesota's Historical Society's has an excellent database. Also Known As: Rugg, A. B. 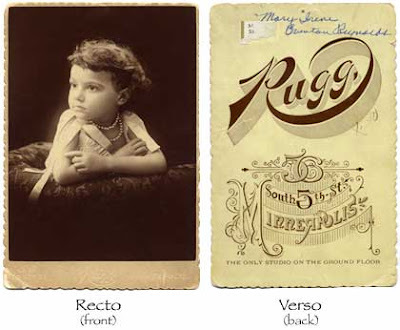 Dates of operation for Rugg at 56 South Fifth Street, Minneapolis, Minnesota are 1886-1892. Conclusion: The photographer's information indicates a time period of 1886-1892. The period of operation is consistent with the card properties analysis of the mid-1800s. Seeking information on the descendants of Edward Samuel “Tige” Reynolds who was born in Oskaloosa, Mahaska County, Iowa on December 11, 1877. He died in Portland, Multnomah County, Oregon on April 26, 1931. 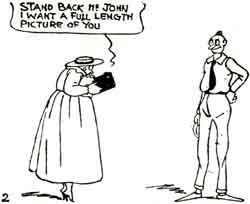 He was a well known political cartoonist for several newspapers in the northwestern part of the United States including the “Portland Oregonian” and the “Tacoma Daily Ledger.” Tige Reynolds married Mary Irene Brunton, in Fresno, Fresno County, California on June 14, 1903. They had a son, Edward Brunton Reynolds and a daughter, Dorothy Lee Reynolds. Edward Brunton Reynolds died at Mercer Island, King County, Washington, on October 16, 1980. Edward Brunton Reynolds had a son, Stephen Reynolds and a daughter, Mary Jane (Reynolds) Taylor at the time of his death. A seventeen year old Mary I. Brunton is found living in Fresno, California, in 1900 with her father Edwin and her mother Ella. The census lists Mary as having been born in Illinois in December 1882. Her siblings, Ethel (11 - b. 1889), Edwin (8) and Ruth (5) were all born in California. This indicates that the family moved to California sometime between 1882, when Mary was born in Illinois, and 1889 when Ethel was born in California. Early photographs were taken to mark passages in a person's life. 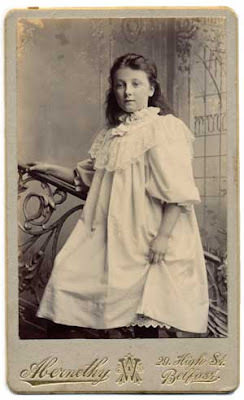 Mary's younger sister Ethel was born in California in 1889, so perhaps the photograph was taken when the family decided to make the move to California prior to 1889 as a memento for those family members who stayed behind. In the alternative it could have been taken if the family traveled to Minnesota for a visit in or around 1886, after having moved to California at an earlier date. January 4, 1919, The Centralia Daily Chronicle announced that "Mr. and Mrs. Reynolds have moved to Tacoma with their two children, Dorothy Lee and Edward, both of whom were born in Tacoma, and will make their home in Tacoma at 1115 North E street." 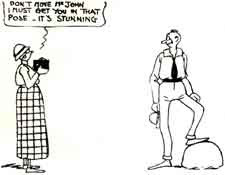 Reynolds was returning to the Tacoma Daily Ledger as a political cartoonist. Mary and Edward are found living in Tacoma with their children, Dorothy and Edward, in the 1920 census. Sharing their home is Mary's sister Billy Brunton, who is thirty years old at the time of this census. Mary's sister Ethel, of the 1900 census, would be approximately thirty or thirty-one years of age in the 1920 census. The Mary I. married to Edward Reynolds is consistent with the Mary I. Brunton of the 1900 census. Mary and Edward's son Edward Brunton died in King County in 1980, this may explain the photograph being found in an antique store in Monroe. Conclusion: The little girl in the photograph looks approximately four or five years old. If this is the Mary Irene Brunton of the 1900 census who was born in December 1882, the date of the photograph would be 1886. This is consistent with the card stock analysis and the years of operation analysis for the Rugg Studios. The limited information found for Mary Irene Brunton Reynolds is consistent with the time period of the card and imprint analysis. The little girl in the photograph may be the Mary Irene Brunton married to Edward (Tige) Samuel Reynolds. Further research is necessary, but this is an excellent start. This analysis demonstrates how a photograph alone can provide many clues as to a family or collector's mystery. A step by step photograph analysis will be posted at Shades Of The Departed as a series. Severa, Joan. Dressed for the Photographer. Kent: Kent State University, 1995. 1900 U.S. census, Fresno County, California, population schedule, Fresno City, p. 312, dwelling 48 , family 73, Edwin Brunton (Head); digital images. Heritage Quest (http://persi.heritagequestonline.com/ : retrieved 15 March 2008); citing NARA microfilm publication T623, roll 85. 1920 U.S. census, Pierce County, Washington, population schedule, Lemons Beach, p. 218, dwelling 59 , family 60, Edward S. Reynolds (Head); digital images. Heritage Quest (http://persi.heritagequestonline.com/ : retrieved 15 March 2008); citing NARA microfilm publication T625, roll 1935. Unknown, "Tige Reynolds Joins Ledger Staff, " The Centralia Daily Chronicle, 4 January 1919. Online archives. http://access.newspaperarchive.com : 2008. Minneapolis 1886, Courtesy of Minneapolis Public Library, Minneapolis Photo Collection, M0074. (http://www.mpls.lib.mn.us/mphoto.asp : retrieved 15 March 2008). Just What Is A Collection? 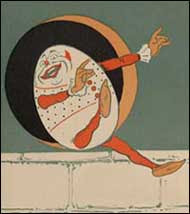 "When I use a word," Humpty Dumpty said, in a rather scornful tone, "it means just what I choose it to mean, neither more nor less." The purpose of this blog is to explore my collection of photographs. But what exactly constitutes a collection? I do know that when it comes to collecting, there is an old saying that goes - "you must stand for collecting something or you will fall for collecting anything." Alright, close enough! (3) the items have inherent unity by virtue of a single topic or several thematically related topics. So in plain language - I have a collection of vintage photographs, the medium is photography. The collections within that medium are the following formats - Daguerrotype, Ambrotype, TinType, Carte-de-Visite, Cabinet Cards, Photo Postcards, and Albums. The next question is - How many items are necessary to form a collection? I have asked this question of just about everyone I know and after much input and deliberation my HD definition is "three of anything associated" constitutes a collection. One of anything is a treasured possession! Two of anything is a pair! And Three of anything is a collection! Now these definitions are a work in progress and I would love to hear your opinions. I am more than willing to incorporate the good stuff you pass along to me. My husband, Mr. Maven, will be thrilled to know that in many circles the word hoard is used interchangeably with collect, as that is what he calls my passion. William Abernethy started his first photographic studio in Belfast in 1885. William claimed to have photographed four generations of the Royal Family. His son, Harold, photographed the Prince of Wales, later to become the Duke of Windsor. At one point in his career, William had seven studios through out the province; he and his assistants were known to average three hundred client photographs per day. In 1900, William Abernathy was honored with a Royal Warrant in Belfast, as photographer to Her Majesty, Queen Victoria. He photographed her during the Royal visit to Dublin in April 1900. Queen Victoria was never particularly enthusiastic about her kingdoms of the “Celtic fringe.” During her sixty-four year reign, she spent seven years in Scotland, seven weeks in Ireland, and seven nights in Wales. It must have been exceedingly difficult to obtain a Royal Warrant in Ireland or Wales. Mr. Abernethy was very fortunate. Eastern Montana is a harsh place; flat, barren, hot in the summer, cold to the extreme in the winter, and sparsely populated. And that is the description of eastern Montana today. Imagine what life was like in the 1800s. Can't? Neither could I until I read Donna Lucey's book, Photographing Montana, 1894-1928: The Life and Work of Evelyn Cameron, and traveled to eastern Montana to see for myself. In the late 1970s, Lucey discovered thousands of Cameron’s photo-negatives stashed away in the basement of Cameron’s best friend, Janet Williams', crumbling home. Coated with over 50 years of dust and dirt were 1,800 glass-plate and film negatives, 2,500 original photographic prints, letters, manuscripts and Cameron's diary. The diary contained a volume from each year except one from 1893 to 1928 which meticulously detailed pioneer life in Montana. Cameron's photographs, together with her daily diaries, provide one of the most detailed records available today of life on the Great Plains. Those glass plate negatives and Evelyn's diaries became the basis of Lucey's book. Two years ago my husband and I traveled to Terry, Montana, the hub of Evelyn's photographic work. I was disappointed when we arrived to find the Evelyn Cameron Museum closed. As we stood reading the sign on the door, someone walking down the street stopped and in typical Montana fashion, suggested we call the curator at her home. He was sure she'd come over and open up just for us; we called, and she did. I will be forever grateful, as it was a wonderful experience and really brought the book and the woman to life. You only had to step outside the Museum door and survey the area around you to envision the Montana of Evelyn Cameron, it has not changed that much. Being honest, I could not live in eastern Montana, and how a well-bred Englishwoman in the late 1800s could, is beyond me. Fortunately, it was not beyond the resourceful Cameron. We know that because Evelyn left behind a legacy, a written and photographic record of her life that shows us the remarkable strength and ingenuity of this tough frontier woman. Evelyn was born Evelyn Jephson Flower on August 26, 1868, at Furze Down Park, a rambling country estate near the small town of Streatham, just south of London. Her father, Philip William Flower, was a successful East Indian merchant. Evelyn was the fifth of six children born to his second wife Elizabeth. Evelyn also had nine half-siblings, born to her father's first wife Mary who had died in 1850. Almost sixty when she was born, Philip Flower died before Evelyn was four years old leaving her the beneficiary of a fairly substantial trust fund that gave her an income of £300 per year. Wickham Flower, a London attorney and one of Evelyn's cousins, was the trustee for her inheritance. Evelyn's half-brother, Cyril Flower led a very glamorous privileged life. Cyril became a barrister at twenty-seven having been educated at Harrow and Cambridge. He was considered the handsomest man of his day. His best friend was Leopold de Rothschild, of the banking family, and he married Leopold's cousin Constance. He became a member of Parliament in 1880, served as Whip to the Liberal Party and Junior Lord of the Treasury under Gladstone, and in 1892 was raised to noble rank with the title Lord Battersea. The Batterseas entertained on a grand scale and it is this life that Evelyn left when she married Even Cameron. 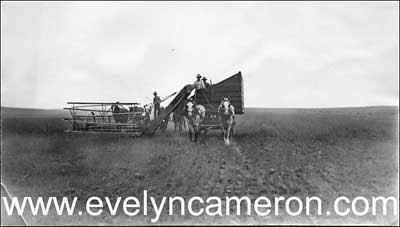 In the fall of 1899, Evelyn married Ewen Somerled Cameron, the first born son of Reverend Allan Gordon Cameron. Evelyn's family did not approve of her choice. We can only speculate as to their reasons. Perhaps because Ewen was fourteen years older than Evelyn and in poor health. But more likely was the fact that at the age of thirty-five, Ewen was without either an established career or a substantial inheritance. His prospects for success were limited. Ewen was an eccentric whose great interest in life was wildlife. Prior to marrying Evelyn he had lived on a virtually uninhabited island among the Orkey Islands where he studied the habits of gulls and turns and amassed an impressive collection of stuffed birds. Ewen considered himself a scholar and scholars required the financial ability to maintain their pursuits. He had no such ability. Evelyn and Ewen honeymooned in the remote badlands of eastern Montana Territory in 1899. They had come to hunt, a pursuit they both enjoyed. They were accompanied by an English cook and one of General Custer's old scouts as a guide. Montana had been recommended to them by Evelyn's older brother Percy, who had traveled up the Yellowstone to Miles City on a hunting expedition and told tales of the bountiful wildlife. nor a sound more civilized than the Falcon's angry scream. Ewen and Evelyn decided to leave London behind and settle in eastern Montana. The British newspapers were filled with stories of striking it rich in America and in Montana in particular. Evelyn had no regrets about leaving England; she could lead the outdoor life of riding and hunting she loved and leave behind her disapproving relatives. They decided to raise horses, as both were excellent judges of horse flesh. Ewen, unfortunately, had no business sense. They moved to the Eve Ranch (named for Evelyn) with its crude three-room cabin constructed of logs and a stone foundation. Their attempts at raising horses on the open range had been unsuccessful. Ewen now decided to breed polo ponies for sale to Europe's wealthy sportsmen. He entered into a partnership with one of Montana's "cattle kings" and imported two exotic Arabian stallions. The cost of ranching was more than the Camerons had expected. In one instance, Ewen had written a bad check he could not cover. Evelyn's cousin, Wickham Flower, was contacted to cover the shortfall, but it took a great deal of time to settle the matter between England and Miles City, Montana. The failure to resolve the matter quickly incurred a $1,000 penalty on the Cameron's partnership. Then the bank in Miles City, in which they had all their money, failed. Again, Evelyn contacted Wickham and asked for an advance on her money. Wickham responded that no advance was possible. It was Evelyn's money, but because she was a woman, she had no control over it. Ewen, discouraged, wanted to return home. Evelyn wanted to stay. In an effort to remain in Montana, Evelyn started taking in wealthy boarders. This too was not a success. The boarders only created more work for Evelyn and often failed to pay their rent. The polo pony breeding came to a disastrous end. The horses that didn't die in the railroad cars, died on the docks waiting to be shipped to England, or died on the long voyage aboard ship. Only two horses made it to England and their buyer found them wild and hard to handle. Evelyn's next venture was raising vegetables for sale. She received no assistance in her business venture from her husband, as she had not with the boarders. She raised the vegetables, loaded hundred of pounds of her produce into wagons and drove over great distances to sell her valuable commodity. 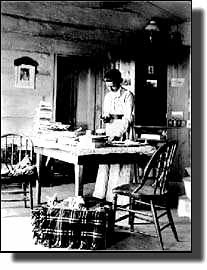 She sold to cook wagons on the range, cowboys in saloons, remote ranches and railroad section houses. It was a tiring day spent in the elements, but Evelyn could earn as much as $5.10/day (cowboys were making $30 - $45 per month). Evelyn's most successful money making venture was to become her photography business. She took up photography and took thousands of wonderful pictures of friends, neighbors, their children, and the wildlife of the high plains. She was encouraged in this pursuit by one of her boarders and purchased her first camera by mail. She decided to wrestle with the intricacies of the dry plate glass negative, unwieldy, 5x7 Graflex camera at a time when most people were using the new smaller easier to handle Kodak film camera. She later purchased a No. 5 Kodet that was designed for 5 X 7 plates or film, as she liked the tonal quality of the plates. Ewen wrote articles about Montana wildlife for publication that were accompanied by Evelyn's photographs. Evelyn wrote articles that she illustrated with photographs and sold her photographs to other authors. Cowboys and passing ranchers stopped by the Eve Ranch to be photographed by Evelyn and she often traveled on horseback for hours or days to reach remote ranches or an eagle's eyrie to take a photograph. Cowboys and sheepherders were some of her favorite subjects as were the wildlife she adopted and tamed. She made albums as gifts for friends and relatives. For her professional photographs she charged per the number of prints ordered, with the caveat that the buyer be pleased with the photograph. She was not an instant monetary success, as she had to keep going back to retake photographs until her customer was pleased. This required a great deal of time and photographic materials. "Ewen posted photographic accounts & makes me $4.95 in the hole yet. Made $31. Spent 35.93." As I pay tribute to Evelyn Cameron, she also paid tribute through her photography to the oft ignored women pioneers she encountered. Those of us who search for bits of information regarding our female ancestors know historians and photographers would fore go information on these women in favor of their male counterparts, perhaps because so many historians and photographers were men. As a woman, Evelyn brought her unique perspective to their struggles and accomplishments. Evelyn wrote an article in the June 6, 1914, issue of Country Life that illustrated the women whose company she sought and enjoyed. It was about the Montana Cowgirl and was illustrated with action photos of the Buckley sisters, know in the area as the "Red Yearlings" because of their manes of red-blond hair and their expertise as horsewomen. 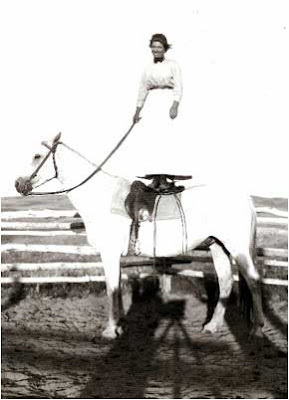 All three sisters may be said to have been born in the saddle, and are accomplished in the incidental work of branding cattle, breaking horses and throwing the lass0. . . A book might be filled with their exploits and hair-breadth escapes when riding "broncos," Evelyn wrote. The sisters became famous and were sought after by Wild West shows. Shy by nature they declined the theatrical life and an invitation to perform before Teddy Roosevelt. Many of the women of Montana during this period are known to us today only through the extraordinary efforts of Evelyn Cameron. Her beloved husband, Ewen, died in 1915 leaving Evelyn to run the ranch alone for the next 13 years until her death. Evelyn left the ranch and all of her belongings to her best friend, Janet Williams, who leased the ranch land and packed the Evelyn's belongings into her basement where they were discovered by Donna Lucey. "I wish I would lead a life worthy to look back upon," Cameron wrote not long after moving to Montana. "I am far out of the path now." How wrong she was and what an amazingly worthy life she led. Official Home of Evelyn Cameron and The Evelyn Cameron Foundation. 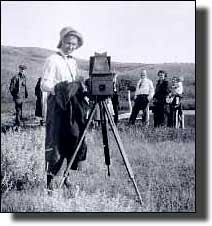 Lucey, Donna M., Photographing Montana, 1894-1928: The Life and Work of Evelyn Cameron, Mountain Press Publishing Company, Missoula, Montana, 2001. Wilson, Kurt, The 100 Most Influential Montanans of the Century. 43. Evelyn Cameron, Special for The Missoulian Online. Remarks of Lynne V. Cheney, The National Cowgirl Museum and Hall of Fame, November 2, 2001. 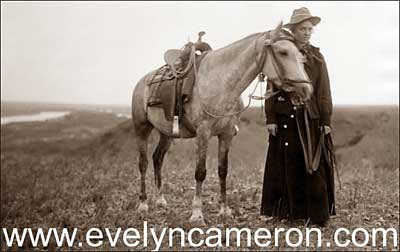 National Cowgirl Museum and Hall of Fame, Library and Research, Evelyn Cameron. Montana Historical Society, Archival Sources at the Montana Historical Society, Cameron, Evelyn and Ewen Manuscript Collection 226. Prairie County Museum and Cameron Gallery, Evelyn Cameron Story, Museum Brochure. [Museum located at 101 Logan Avenue, Terry, Montana].